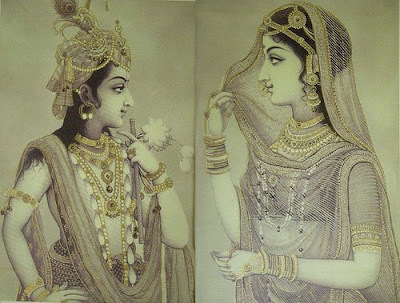 Radhekrishna is a name which I murmur, speak aloud or keep within my heart but do so very often. I am not a very religious person and not sure since when did I start believing in God and since when did I fold my first hands before God. The first thing that I remember was my ‘Ma’s Pooja’ where she kept numerous ‘bhagwanji’ as I fondly call them. Their pictures were all so colourful..Shivji in Blue shade, Ganeshji in Orangish Yellow..and so on. One picture which I lost my heart on was very sweet, innocent, kind of less Godly and more friendly and loveable - ‘Krishnaji – in his childhood times’. He looked so genuine, so sweet that my heart as a little child grew very fond of his looks – believe me it was looks! I visited my Aunt one day. My cousions were out that evening and all elders were busy chatting in the drawing room. I was sitting in my cousion’s study room, sitting on the bed I noticed a small booklet. It was full of Hindu Prayers for all Gods (as we call it ‘Book of Aarti’). I indifferently turned the pages and moved to the last leaf where it said ‘Radhekrishna ji ki Aarti’ (Prayer of Lord Radhekrishna). Some unknown but strong instinct ran through me and I read it from the beginning till the end, closed it and kept it aside. I do not believe myself but I remember that Aarti (Prayer) since then! Radhekrishnaji are deeply embedded in my heart and run deep down my soul. 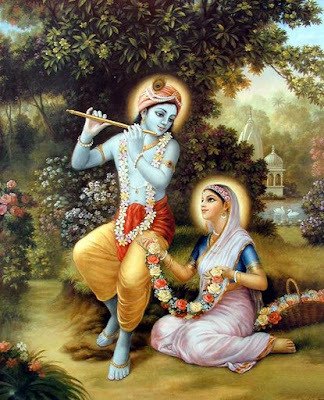 His devotees are many and I may be only a small being to love and admire, he is everywhere and all around me. Read below for lovely lyrics by Ravindra Jain and Download Online. 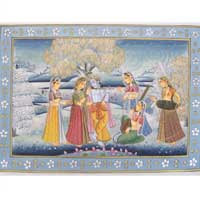 Hare Krishna Hare Krishna Krishna Krishna Hare Hare! Hare Rama Hare Rama Rama Rama Hare Hare! prabhuji aap kitne sundar hain..likha auron ke liye par khud hi nihaarte hue mann nahi bharta..